The two large 16.5" diameter heavy duty horn speakers will reach out over longer distances than cabinet speakers. Horn speakers offer considerable sound pressure for voice announcements. This system includes the following items for a complete solution to get you up and running fast on a budget. 1 - Commercial Amplifier w/ 5 inputs - 120Watts @ 70V audio output for transformer speakers for high volume power performance. 2 - Atlas Sound 16.5 inch Weatherproof Horn Speakers with powerful 30watt rear drivers using 70v Transformers. 1 - 500FT Spool of Direct Burial UV Resistant Speaker Cable. 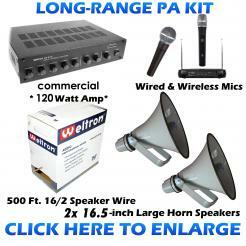 1 - Hand Held Wired Microphone and XLR cable included. We work hard to only sell quality long lasting products that have stood the test of time.